Main Restaurant: 50. Riverside Terrace: 80. Winter Garden: 24. Summer Roof Terrace: 18. Metro station: Malostranska (line A). Kampa Park in Prague is one of the city's finest restaurants, and at the higher-end, one of the most popular. It is set in an exclusive location beside the Vltava River on Kampa Island, next to Charles Bridge. Kampa Park offers flamboyantly presented international fare, which includes fresh fish and seafood, innovative meat dishes and luxurious desserts. To compliment the fine cuisine, Kampa Park stocks an extensive range of Czech and International wines (over 150 global vintages). Other drinks include an impressive list of cocktails. 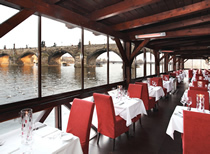 Kampa Park is Prague Experience's most requested restaurant for very special occasions. It is also a firm favourite with the business community, who come here to loosen their ties and admire the views of Charles Bridge and across the river. Good reviews in the international press, peppered with superlatives, ensure Kampa Park is popular with visiting dignitaries and celebrities. Hillary Clinton on a visit to Prague once remarked "I wanted our last night at Kampa Park to go on forever". The dining areas at Kampa Park are split into four main parts: the famous riverside terrace - a heated conservatory looking out to Charles Bridge and the river (see picture); the main restaurant; the winter garden - a heated conservatory overlooking a tributary of the river; and the summer roof terrace - overlooks Charles Bridge and the river, and which is perfect for al fresco dining from spring to autumn. Book your table through Prague Experience and you will be allocated the best table available (with fine views) in the most appropriate area of the restaurant, according to the time of day, season and weather conditions. You are of course free to state your wishes too in Special Requests on the booking form. A quiet, refined restaurant, Kampa Park can accommodate groups of all sizes, and is perfect for special occasions and corporate functions. Advance reservations are essential.